The beginning of the new 3-liter Formula was thought to favor Ferrari and their V12 engine but Jack Brabham and Ron Tauranac had other ideas. Their solution was to take a light spaceframe chassis and marry it to an Oldsmobile based Repco V8 engine. Repco's was a parts supplier and manufacturer in Australia that was heavily involved with the Tasman Series. Providing modified engines for the Brabham Tasman cars they were looking for a replacement for the Climax engines that they were currently using. Oldsmobile had abandoned the all-aluminum block that they had been developing for a new Buick passenger car and this proved a good starting place for the new Repco engines. Brabham hearing of these developments contracted Repco to provide him with some 3-liter Formula 1 engines. In the hands of ex-Cooper engine man John Judd the Repco V8 would produce 311 bhp which was less than the new Ferrari's 360 bhp. 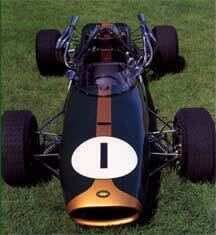 But a race car is more than just its engine and Ron Tauranac who had been working with Brabham since his Cooper days designed a chassis that was simple yet light. The multi-tubular spaceframe was also easy to fix after the inevitable accident. A big advantage for the new car was that it could go the distance on 35 gallons. The car won four races in a row and partnered with Denis Hulme, Brabham won his third World Championship and the first one to win it in his own car.